The subject of this year’s professional development day for Iyengar teachers like myself, was Pranayama. I arrived at the MDIIY, found a place to unroll my mat in the packed main hall and spent a few minutes before we started, catching up with other teachers. When I tell my own students to ‘bring your bolsters for Pramayama next week’ there are smiles and mutterings of ‘oh good’ and I was feeling exactly the same now, knowing I needed this Pramayama day to’re-charge’ my batteries. What is Pranayama some of you may be asking, does it mean ‘breath’? B.K.S. 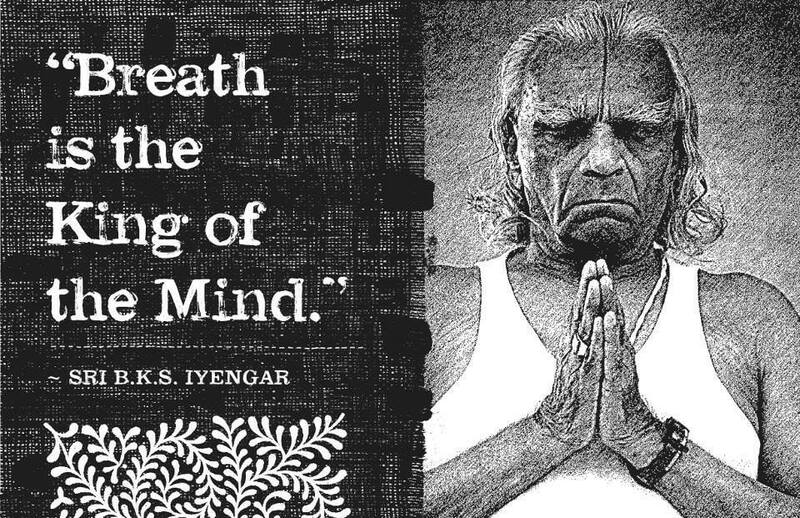 Iyengar says that although often translated as ‘breath’ this is only part of Pranas manifestations in the human body. Prana is the energy permeating the universe on all levels. It is physical, mental, intellectual, sexual, spiritual & cosmic energy. All vibrating energies are prana. All physical energies such as heat, light, gravity, magnetism & electricity are also prana. It is the hidden potential energy in all beings. As Yogis we practice Pranayama as a conscious prolongation of inhalation, retention & exhalation. Inhalation is the act of receiving prana energy in the form of breath and retention is where the breath is held in order to savour that energy. Most of us assume that because breathing is automatic, it is beyond our active control. This is not true. In Pranayama one trains the lungs to be more efficient by changing its rate, depth and quality. The lung capacity of athletes, mountain climbers and yogis is far greater than that of others. According to yogic texts, regular practice of Pranayama prevents and cures diseases. Better breathing means a healthier life. The Asanas we practiced today were to prepare physically and mentally for Pramayama. Many worked on opening the chest, quietening the mind, and learning how to maintain an erect spine whilst sitting. Some of these things come much easier than others but the aim was to be extremely sensitive to what we were feeling and experiencing. As teachers we were learning how to observe, help and adjust students with these asanas, as students (and we are all perpetual students) I was observing what I needed to balance and correct in my own body and how that adjustment changed my breathing, my mind. As the day drew to a close I marvelled at the wisdom of B.K.S. 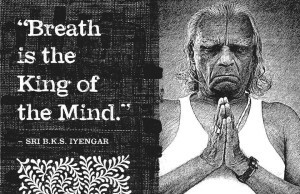 Iyengar, our Guru and gave my thanks to him and the teachers he has handed this wisdom down to. It’s with gratitude I now carry this knowledge forward and will be sharing it with you soon at your next Pranayama session!